It’s the year 2060. New York City Homicide Lieutenant Eve Dallas is leaving 1 Cop Plaza with a rare chance to get off work early . . . but it doesn’t happen. She receives a call from Psychiatric Consultant Charlotte Mira. Her husband has been assaulted and his cousin abducted. Eve immediately begins an investigation, putting aside her personal involvement. Dennis Mira is a witness. Coming to the home he and his cousin own—his grandfather’s estate—he finds a shocking sight. With her partner, the effervescent Peabody, Eve doesn’t merely discover facts about the victim but confirms them. Edward Mira is a former senator, now doing business in the private sector. He’s made enemies in whatever path he chose. Also a ruthless womanizer, even at 70, he uses and discards lovers as easily as he does his opponents in the business and political world. “She didn’t know or care much about politics, but she had a vague image of Senator Edward Mira. She’d never have put the bombastic, hard-line senator . . . on the same family tree as the sweet, slightly fuddled Dennis Mira. But family makes strange bedfellows. No matter who Eve asks or where she goes, she meets with the same line of resistance. Eventually Edward returns to the house from which he was abducted, but this time he’s very much dead. Enlisting the aid of her husband Roarke, he of the shady past, hacker par excellence, as well as being the richest man in the world, Eve sets out to find Edward’s killer from among the many suspects and discovers some startling facts along the way. As other men are abducted and more bodies appear, the trail to the murderer leads backward, to Yale University and the violent time of the 2011 Urban Wars, when a group of bored young men played a very dangerous game, and the most important clue is a very discreet little tattoo, the Celtic symbol for brotherhood. . . .
As with all the Eve Dallas novels, J. D. Robb creates a colorful array of characters making up the NYPSD, as well as those in the civilian sector. The bantering dialogue between Eve and partner Peabody, as well as the more passionate exchanges between her and husband Roarke, plus the futuristic police procedures are the hallmarks of this very enduring series. 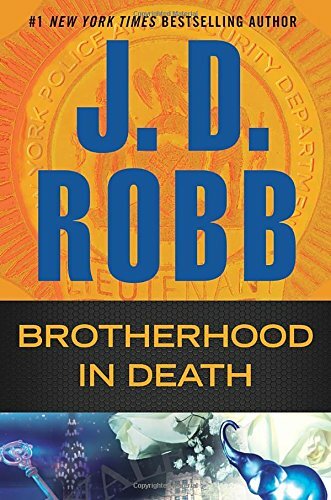 With a story where a cop’s loyalty to justice and the law must take precedence over her personal opinion of the victims, Brotherhood in Death is an entertaining entry in the series and will not disappoint.